The Pedestrian is a 2.5D puzzle platformer that takes “puzzle platforming” literally. You play as The Pedestrian (aka the male bathroom symbol) who works at the restroom sign along with his beloved (the female symbol). When she disappears, you must escape your day job and embark on a perilous journey where you piece the “sign world” back together to make it through. Another fantastic monthly update coming at you right after Easter! Full of artificially colored eggs and ham. So what’s happening in the world of The Pedestrian development. Well, it’s developing! We’re working on the final few areas, getting things all lit correctly, and more. But don’t stop reading here, continue down for the whole scoop. Here is the video version of this update. Feel free to watch it or read below if you hate the sound of my voice. Just kidding, reading is good for you. You should try it once in awhile. This month, much of the work has gone into the Finale section. We noticed during our testing that the finale wasn’t quite right. It was too confusing and sometimes took way too long to complete. So we’ve restructured it to be much more focused by removing clutter and highlighting the important parts better. We’ve also added in more tutorial content before the finale to better prepare players for what’s to come. With the finale being at the end of the game, we wanted to make sure it wrapped up the game nicely while not being extremely hard or frustrating. So it’s been fun finding that balance. The recent color and lighting pass is well underway. We have all our lighting situations and area colors planned out in our paintovers. Which we then reference these paintovers when tweaking and lighting the areas. Recently we’ve switched from Unity’s Enlighten lightmapper to an asset store alternative called Bakery. One of the benefits of Bakery is the fact that it’s a GPU lightmapper, which makes bake times for scenes significantly faster. This has helped us be able to iterate on the lightmaps much faster. For example, to bake the downtown scene in Enlighten would take 4-5 hours (normally we’d do bakes overnight). With bakery it takes 20-30 mins for a high resolution and 5-8 mins for a low-res bake. While Bakery comes with its own set of hurdles, the bake speed alone atones for it. Another hotspot of work this month was the hub in the Rooftops area. Before, it contained a few issues that had the potential for players to get stuck. Which is obviously no bueno. It also had a few visual hurdles we had yet to attempt to solve. So we made a few changes to make it simpler for us, while also having better player communication so it should be easier to understand. In terms of puzzle amount, the Rooftops is the most complex area, so having a hub that’s easily understandable is a pretty high priority. More music is coming in! We wanted to share another track that our sound designer Logan has been working away on. Click below to check it out. One of our tasks this month was controller support. But the question arose, “How do we shrink down the convenience of the mouse and keyboard into a controller?” What we’ve decided is a “false” cursor that is controlled by inputs from the controller. This way it’ll act similar to an actual mouse cursor, while allowing us more control over it. An added benefit is that we’ll use this same cursor when using a real mouse, which gives us some bonuses, like using the cursor as a feedback tool. This helps make the cursor more ingrained into the game and less like you’re web browsing. Jed playing the game with a controller!! This update just contains highlights from the last month of development. For a more day to day list, check out The Google Spreadsheet with our task manager export. 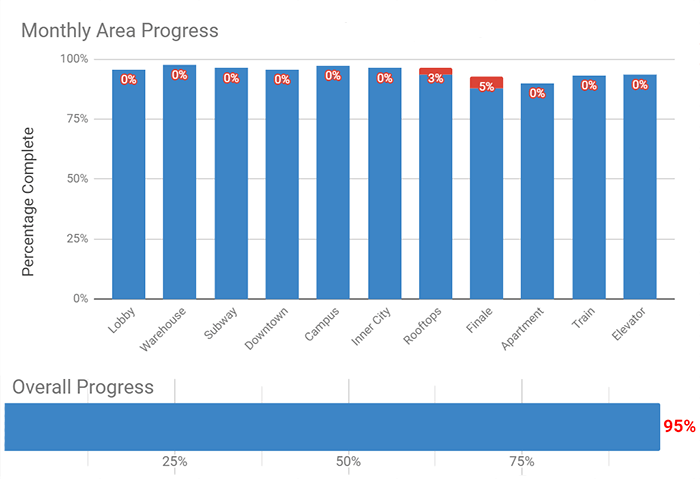 You can see from our graph that the area progress that happened this month was mostly in the Finale and Rooftops areas. Which is great because it brings up the low bars to be close to even with the rest of the areas. The last low boys are the Apartments, Train, and Elevator scenes. As you probably could tell, the game isn’t complete yet. We had written on last month’s graph that we’d be content complete in April. But unfortunately we’re going to have to push it out another couple months. We’re still making awesome progress and not really hitting any major roadblocks yet. It’s just that tasks are taking longer than our little 3-man team anticipated. To ease this blow we are announcing that we’ll be sending out our beta copies here pretty soon. Our current sprint is to finalize all the last bits and pieces before sending them out. So, if you are in a qualifying tier, you can expect an email where you may opt into the beta program. We are going to split up the beta testers into smaller groups to get more iterative feedback, so if you don’t receive your email next week, then chances are you’re in a later group. Please note that if you do participate in the beta, then expect that the final game may be ruined for you, because you basically will have played it already. But we appreciate your sacrifices for the betterment of the game! We can’t say enough how much we appreciate your patience. We’re working overtime to get the game into your hands and are excited to see what you think! Thanks again and we’ll chat next update! Welcome to our monthly update post! Here you'll find a video showcasing our progress on The Pedestrian, as well as, an article version of the update. Here's our latest update for our upcoming game The Pedestrian. Read about what happened last month. We go over our progress made on The Pedestrian since our last update.